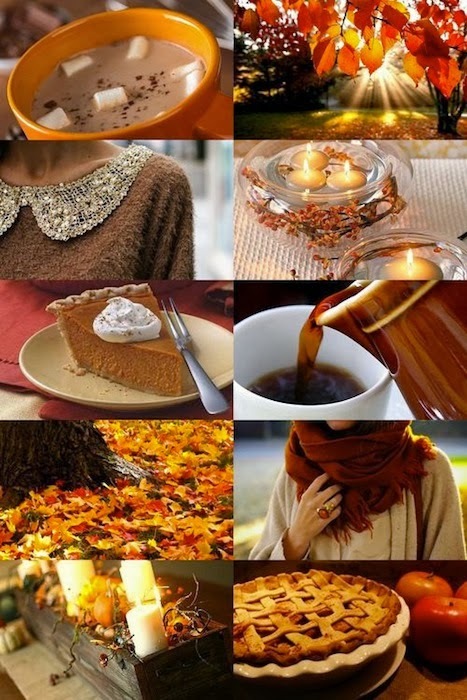 I found this picture on Pinterest that pretty much covers all of the things I love and look forward to each Autumn. So, since the first official day of the season is on Sunday, I figured I'd share some of the things I'm most looking forward to this season. ONE. Pumpkin picking. It's by far my favorite Autumn activity. Each year JD and I will get in the car and head out East to the North Fork and spend the day picking pumpkins on a gorgeous farm, have lunch in Greenport, maybe stop at a winery or two to pick up a few of our favorite bottles, and stop at Briermere for a raspberry cream pie on the way home. It's always a good day, especially if it ends with pie. TWO. As previously mentioned, pies. Raspberry cream from Briermere, homemade pecan, and pumpkin. THREE. Watching the leaves change. FOUR. Going on a long walk through Central Park. FIVE. Homemade pumpkin flavored snacks such as cupcakes or almonds. SIX. Wearing cozy sweaters, scarves, and boots again. SEVEN. Maple lattes and pumpkin chai tea. This time of year I crave a maple latte from Gorilla Coffee in Park Slope. More recently, (on Tuesday) I discovered pumpkin chai at David's Tea, it's so good. EIGHT. Visiting the North Fork vineyards with a picnic. NINE. Fall fairs and festivals. The Stone Street Oyster Festival is tomorrow, though we're not sure if we will be able to make it this year. TEN. I know there has been a lot of pumpkin flavored this and that on this list so far, but I am very much looking forward to tasting the pumpkin beer that we made a couple of weeks ago. It will be ready in a week and a half! What are you looking forward to as the season changes?